Lagos: Night fire guts shops in Gowon Estate – Royal Times of Nigeria. A late night fire early on Tuesday morning gutted five of eight shops attached to a Union Bank building on 411 Road Junction, Gowon Estate, Federal Housing Authority (FHA), Egbeda. The inferno was noticed at the make- shift shops at about 11.20 pm, shortly after electricity supply was taken by the providers, Ikeja Electric. The youth had brought down the fire before the arrival of the men of the Lagos State Fire Service from Agege. Meanwhile, a dry cleaning shop, a mini-cold room as well as a provision shop run by an octogenarian had every item in them destroyed by the inferno. The Fire Service Officer who led the rescue team, Mr Julius Adewuya, said: “We responded immediately we were called. “The timing of the call was good because there was no traffic but we had hitches getting into the estate because of bad roads. The roads are near impassable but we managed to come for the rescue. “Equally on arrival, we discovered that there were not enough notices for the people to know which service point is nearest to them to call. “`We appeal to the residents of this estate to invite us to enlighten them on when and how they could get timely assistance from the fire service,’’ he said. 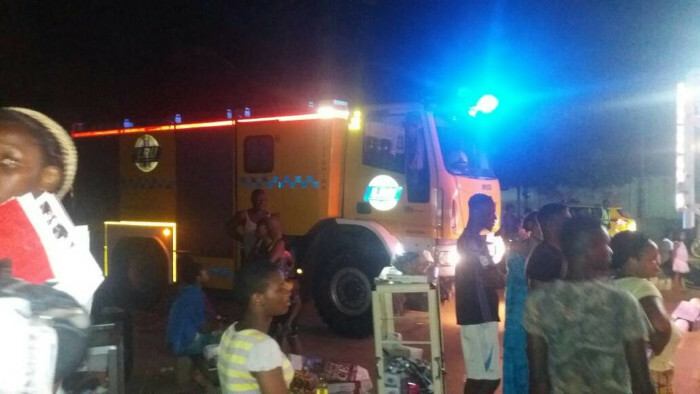 Meanwhile, the Lagos State Emergency Management Agency (LASEMA) arrived after the fire had been put out but they also helped to ensure the fire was totally controlled. Also mean of the Nigeria Police, Gowon Estate Division, were also on ground to provide security.